Dedicated to enriching lives through daily exercise and healthy eating. view & like us on facebook! 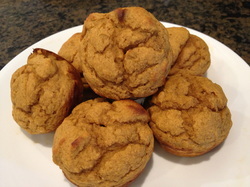 Think Pumpkin bread without all the fat, calories, and carbohydrates! Who doesn't love a warm muffin right out of the oven? What we don't love is the muffin top it can cause! These muffins are about as guilt free as you can get. I promise that you will love them! Preheat oven to 375 degrees. Line muffin pan with liners, or spray with a non-stick spray. Fill each tin/cup 3/4 full. Bake 10-15 minutes until a toothpick inserted in the center comes out clean. 1 muffin = 115 cals/ 13g protein/ 9g carbs/ 3g fat. *nutrition information does not include walnuts. Bench or chair, medicine ball, fitness ball. BEGINNER: Place palms on the edge of a bench or chair, keeping your arms straight, your back straight, and your knees bent. Bend at the elbows, keeping elbows pointing straight back and close to your sides and lower your body straight down until upper arms are parallel to the floor. Keep elbows pointing straight back and close to your sides. Return to starting position. INTERMEDIATE: Perform as in beginner, but keep legs fully extended. ADVANCED: Perform as in beginner, keeps legs extended straight and heels balanced on a medicine ball. VERY ADVANCED: Perform as in beginner, keep on leg fully extended and resting upon a fitness ball from mid calf to heel, while holding the other leg up in the air the entire time. Switch leg positions and repeat on the other side. Ideal You Fitness is excited and proud to bring you the first of what will be a MONTHLY, healthy recipe from renowned chef Jason Williams, also known as the Rock Star Cook! This month's recipe is a variation on Asian vegetable fried rice, using protein-packed quinoa in place of rice. While this is a VEGETARIAN fried quinoa, it's also GLUTEN FREE and can be made VEGAN with the recommended substitutions. Try this recipe at home and come back to our blog to leave your comments ....we want to hear from YOU! Enjoy! Heat a large heavy-bottomed nonstick skillet over high heat. When hot add 1 tablespoon of the oil. . Add the onions to the pan, season with salt and pepper, and cook for 1 to 2 minutes until onion is fragrant Add the garlic, ginger, and scallion whites and stir-fry until fragrant, about 30 seconds. Add the vegetables. Cook until still crisp. Transfer contents of the skillet to a large bowl. Return the pan to the heat and add 1 more tablespoons of oil. Add the eggs and season with salt and pepper. Stir the eggs constantly and cook until almost set but still moist, Break the eggs up with a wooden spoon or spatula. 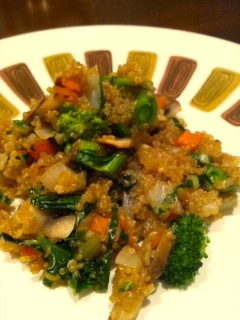 add the quinoa to the pan and use a spoon to break up any clumps. Season with salt and pepper and Add the scalliongreens. Stir all the pre cooked ingredients together with the tamari ( gluten free soy sauce),cook together for 30 seconds more taste and adjust the seasoning if necessary. Serve. I'm always on the lookout for fabulous foods that taste good, have minimal ingredients, and are good for you. It hit the jackpot with this find! There are so many great things about these links. First, THEY ARE 100% NATURAL! No nitrites, nitrates, MSG, or preservatives. The nutritional numbers are impressive: a serving size lets you indulge in 3 links, just 100 calories, only 4 grams of fat, 2grams carbohydrates, a whopping 14grams of protein, and low sodium and cholesterol! WOW!!!! What's not love, right? Second, there are just 9 ingredients, all of which you can pronounce, which means there isn't anything in there that you shouldn't be eating. Ingredients are: chicken breast and thigh meat, water, maple sugar, spices, maple extract, kosher salt, evaporate cane syrup, natural flavor and vinegar. This recipe was shared with one of our fans, Jenni Barr Minarik. Thanks for sharing this yummy dip recipe with us! Very tasty and not tooth-achingly sweet. And it made enough that I'll be dipping for another 2-3 days. Enjoy! Mellisa Joy Dobbins is the founder of Sound Bites, Inc. and a registered dietician. She's also one of my high school class mates! Melissa contributed to the information in this Mom.me article on snacking, which offers some healthy ideas to satisfy the snack monster in all of us. 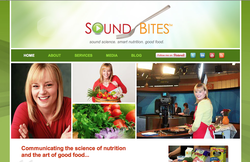 Please consider checking out Mellisa's site, www.soundbitesrd.com for more healthy information! This recipe submitted by IFY fan, Jayne Altic and is published by McCormick. Visit www.moccormick.com for more great ideas. Thanks for sharing with us, Jayne! I stumbled across this little gem on one of my runs to replenish my protein powder. 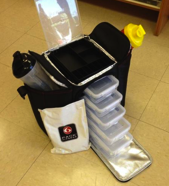 This is a portable cooler with everything you need to get through a full days worth of meals, snacks, and supplements when you are on the go, or away from home. There are two side pockets large enough to hold two shaker bottles each. The top compartment contains a divided tray - perfect for storing any supplements, protein powders, stevia packets, etc. The main compartment has sturdy plastic shelving that neatly holds individual containers for your meals. Each container is freezer, refrigerator, microwave and dishwasher safe. Lastly, there are two freezer cooling packs included to keep everything cold. This is the perfect companion for anyone who prefers to make and bring their own food with them, wherever they go! You can find this at most GNC stores. There is a large size (pictured here) that sells for around $100, and a smaller size that holds less bottles/containers that sells for around $75. A great alternative to regular cane sugar, this natural substance is derived from the Stevia plant and is sweeter than sugar ( 1/2 packet = 1 teaspoon of sugar ) so you can use less of it! 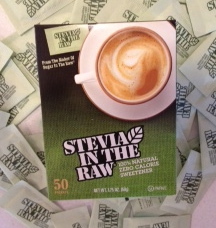 There are many varieties of stevia products available, but this one is my favorites. 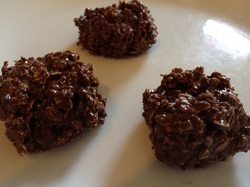 No bake, no guilt "cookies"
These little "cookies" are great to have on hand for those times when you just crave something sweet and indulgent, yet you don't want to ruin all your clean eating. They are also great for those times when you have to "grab and go"! Store them in the refrigerator for up to two weeks once made. Combine the first 6 ingredients listed in a saucepan on the stovetop on medium heat. Stir until all ingredients have melted and mixed together to a smooth consistency. Remove from heat. Pour mixture into a large mixing bowl, then stir in oats one cup at a time. The more oats you add, the denser the cookies will be. Once you've stirred in the desired amount of oats, use a cookie scoop to scoop the dough, and drop onto parchment paper on a cookie sheet. Place the cookie sheet with the drop cookies on it inside the refrigerator for 1 hour, or until cookies are firm and set. Store in a container in the refrigerator. Enjoy! personal training and nutritional coaching.